First up, we have a few brow products. I really do love my Tweezerman tweezers, and although I have tried others that I've really liked, I haven't quite been able to end this love affair! On a day-to-day basis I like to use the Rose Gold Glitter Slant Tweezers* | £23.95 | to tidy up my brows. Something about the shape and the slant of these tweezers makes them perfect for firmly removing any stray hairs. Plus, they're obviously very pretty! I feel like tweezers are one of those tools that you used to pick up for £1.50 from the Boots own brand aisle until you tried a really amazing pair and realised you could never look back... I also have the Mini Point Tweezers from the Tweezerman Petite Tweeze Set | £29.95. I don't find these too fiddly to work with, so if you like the look of both pairs, you could just get this little set. I find these super-pointed ones great for getting out those tiny hairs that don't want to budge! I feel like for far too long a razor has been like how I just explained tweezers... I recently got my hands on the best razor I've ever tried and have been left wondering why I didn't upgrade my routine sooner! I've been using the Friction Free Shaving Gift Box* | £33 | over the past month or two and really recommend checking this out. You can subscribe to get spare razor heads sent to you and I went with the rose gold colour - it even has my name engraved on it! I've never had such an amazingly smooth, close shave and I've never once nicked myself with this razor, which I always do when I have a fresh blade on my usual cheap ones. You also get a lovely, moisturising shaving cream, a scrub to use before shaving and a replenishing post-balm in this set too. I have a few hair essentials here too that I really recommend checking out. The first two products I have are from Phyto - I have the Phyto 7 Daily Hydrating Cream* | £17 | and the Phyto Huile Soyeuse Lightweight Hydrating Oil* | £27.50. The cream is a leave in product - I run a bit through my damp hair before blow-drying it and I love how light the texture is. It doesn't weigh down my hair with greasiness or make it sticky but it definitely leaves my hair feeling and looking smoother and more hydrated. The oil is also something I use pre-styling, when my hair is wet - it's a lightweight milky oil product that's untraceable in the hair but leaves it so soft and silky! There are two styling products that are always on my dressing table and I can't live without! The first is the Umberto Giannini No Wash Conditioner | £7. I'm actually planning a big post on this brand but my essential so far is this lightweight oil spray - I received it in PR, used it all up and repurchased a new one, plus a backup! It smells amazing and gives my hair a shiny, healthy look without making it greasy, even when I apply it liberally. For the opposite effect - I reach for the IGK Jet Lag Dry Shampoo | £23. I honestly don't use dry shampoo very often, as I have a really sensitive scalp, however this one is lightweight and invisible so doesn't aggravate things for me. It adds volume and blots away any greasiness. I'm sure I've talked about my Tangle Teezers and Wet Brushes enough on this blog for them not to fit into this post, however I have another brush I use to blow-dry my hair and it's been a game-changer for my routine. It's the Paul Mitchell Express Ion Medium Round Brush | £18.25. This has pretty much been my secret to getting that almost salon-level smoothness when I blow-dry my hair at home. It's honestly amazing and the shape allows you to really get into the roots of your hair. There are a few makeup bits I couldn't imagine being without! The first is my Bobbi Brown Corrector (Peach) | £19.50. I've been through SO many pots of this because the tone of it is perfect for cancelling out dark circles in just a thin layer of product. It means I don't have to cake on loads of skin-toned concealer. If you struggle with hyper-pigmentation or dark circles around the eyes - I can't recommend this enough! I also couldn't do my makeup without my BeautyBlender* | £17 | and have no idea how I survived before discovering it! I use this slightly damp for both my foundation and my concealer every single day. It has the perfect material for me and the cheaper alternatives just can't mimic how this moves and bounces over my skin. It's a new addition so I was unsure about including it here, but the setting mist I'm obsessed with right now is the Morphe Continuous Setting Mist* | £15. It just gives that fresh, healthy look to my skin, ensuring my makeup never looks powdery or cakey. You don't have to pump this to get the product out and it's such a fine mist. I also use this to wet eyeshadows and increase their intensity. Finally, the Glossier Pink Pouches, which you receive for free with your order from the brand, are so handy. I pretty much have one in every bag to hold makeup, tampons, tablets, you name it! They're really useful when you travel too - they're waterproof and the perfect size for a weekend away. 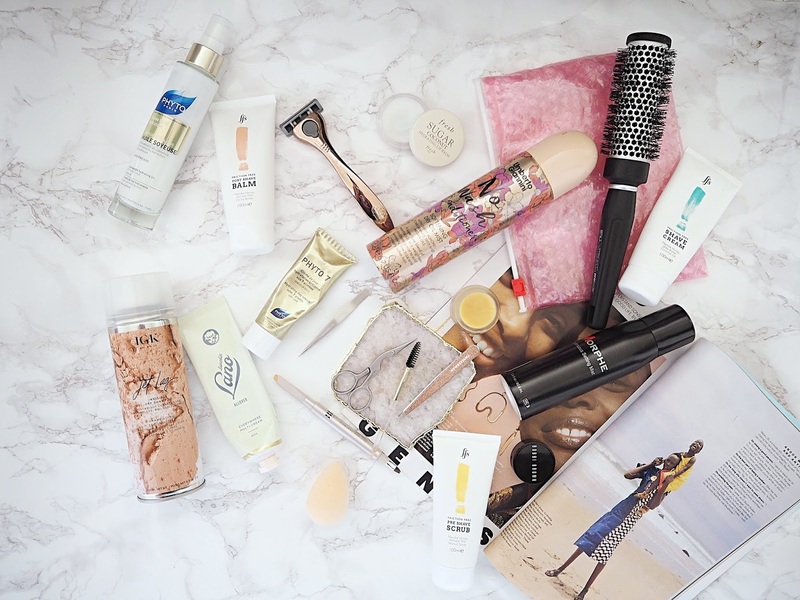 Have you got any essential beauty tools and products you recommend checking out?